This is a great, easy recipe. Well it is if you have a BBQ King near by. Unless you live in Sydney it’s not looking good for you. However! 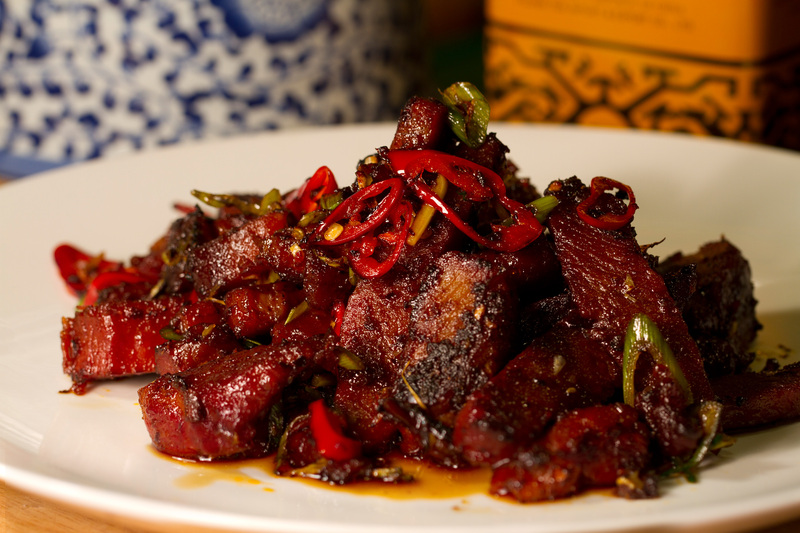 Lucky for you I’ve done a BBQ Pork recipe which you can find here. This does make the cooking time slightly (a lot) longer, but it’s worth it! Your other alternative is going to your favourite Chinese and getting some BBQ pork to take away. Cooked jasmine or basmati rice. Make sure it’s just undercooked and then spread out flat to allow to cool. If you do the absorption method then use slightly less water than usual. If you are cooking in water and then draining, cook it for about 9 mins, strain and cool. 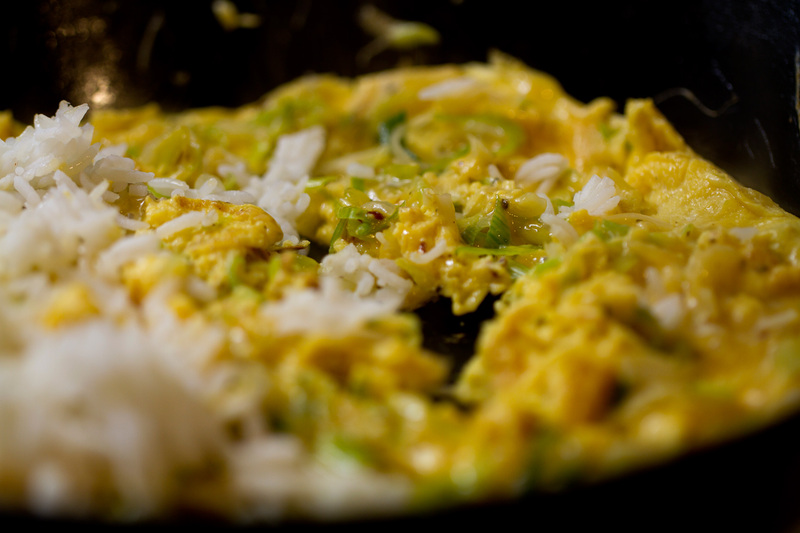 3 Organic Free Range Eggs – Whisk and add salt, pepper and sesame oil. So get a wok or large frying pan on a high heat and get it nice and hot, then add chilli oil and a dash of sesame oil. Add the spring onions and fry off for a few mins so they take on some colour. Now add the egg and move around a bit to mix around the spring onion in the mixture then allow to set a bit like an omelette. Season with a bit of salt and pepper. Now once the egg has half set so the top is a little runny add the rice. 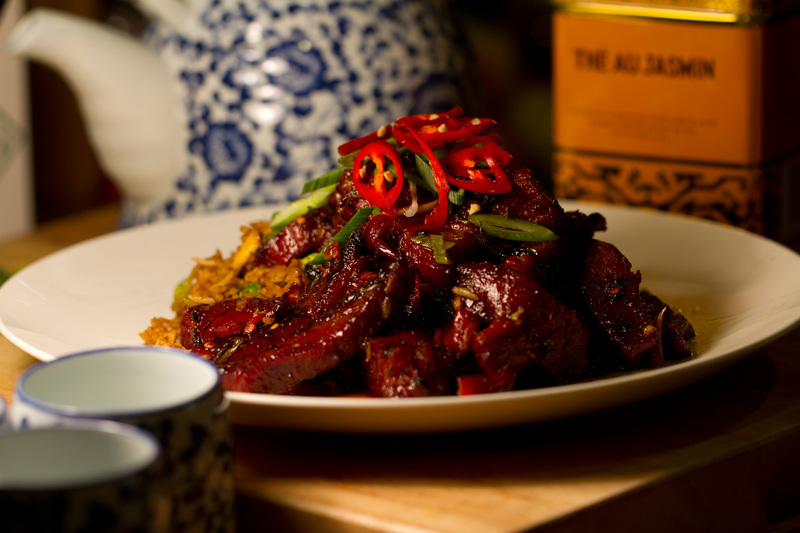 Move around a mix well into the egg then add a splash of dark soya sauce and a drizzle of sweet soya sauce. Now add a small handful of peas and a splash of the bbq pork gravy. Cook this and keep moving around until the peas are cooked. It should only take 3 mins. Once done remove from the pan into a dish you can put in the oven. Cover and put on 120°C in the oven. Now we’ll do the pork…. So once you have your pork it’s really simple. Grab a pan. Get nice and hot, add the chilli oil and a splash of sesame oil. Chuck in the onions and garlic, cook off for a few mins then add the pork. Get it sizzling then add a table spoon-ish of chilli jam. I also added a splash of the BBQ pork gravy that you get with the pork. This just loosens everything off a bit and gets the chilli jam melting. Keep moving the pork around and it will start to take on some colour. You want a little bit caramelised and crunchy at the edges. Once it starts to look like that, add the chilli and toss again for 1 min or so. Remove from pan and plate up.